​​HOUSTON, Texas - All week long I was reading about Syracuse's long, frustrating 2-3 zone defense and the optics at NRG Stadium, and how both were going to cause serious problems for the North Carolina Tar Heels in their Final Four game on Saturday night. And each time I read such an article, I could not help thinking to myself, how in the hell is a 2-3 zone and depth perception going to interfere with the Heels' ability to crash the offensive boards? Because that is where UNC's bread and butter has been all season long, not behind the three point line. If the Heels did rely on the three ball, well then such obstacles would have presented problems. But they don't, and they didn't. At one point in the 2nd half of UNC's 83-66 victory over Syracuse Saturday night, UNC was 0-12 on 3FG, yet held a 17 point lead over the Orange. That is because the Heels were not resound to just swinging the ball around the perimeter for 29 seconds before firing a long distance jumper over the outstretched arms of one of Syracuse's lanky wings. Did you think that they would? With the likes of All American Brice Johnson, Kennedy Meeks, Isaiah Hicks, Justin Jackson and Joel James patrolling the interior, why would they? The North Carolina guards - Joel Berry, Marcus Paige, Nate Britt and Theo Pinson - did an outstanding job of moving the ball and searching for holes in the Orangeman zone so as to pound the ball inside, either to Johnson at the free throw line, or on the block to Meeks or Hicks. And when the Heels did fire from long distance and miss, one of UNC's enormous frontcourt players was there to scoop up the offensive rebound and get a put back layup or dunk. North Carolina had 16 offensive rebounds Saturday night. On Monday night, North Carolina will play for a chance to capture its sixth national championship - and third under Coach Roy Williams. Standing in their way will be the high scoring, defensive minded, sharp shooting Villanova Wildcats, who will be playing for just the school's 2nd national championship and who just got done obliterating the Oklahoma Sooners 95-51. The matchup presents - on paper at least - a battle between two teams who really know how to light up scoreboards. Thus far in the NCAA Tournament, Villanova is averaging 84.8 ppg, while the Tar Heels are averaging an amazing 88.0 ppg. But Villanova is more than a bunch a jump shooters. A veteran-laden squad, Coach Jay Wright's Wildcats are playing better defensively than they are on offense, which is saying alot since the Cats just shot 71.4% as a team from the floor in a Final Four game. The Cats use a mixture of zone, straight up man-to-man and a 1/2 court zone trap that keeps its opponents its toes and, usually, confuses the hell out of them. If you don't believe that, watch Saturday's OU game back again. The Sooners' Buddy Hield, averaging 29.3 ppg entering the contest vs. Nova, was held to just 9 points on 3-14 shooting. As a team, Oklahoma was 19-60 (31.7%) from the floor, including a miserable 6-27 (22.2%) from three point land. To combat Villanova's defensive intensity, the Heels will need to move the ball efficiently on offense, look to exploit mismatches inside - which there should be plenty of - and when open, knock down perimeter shots, including looks from three. Joel Berry, as he has been doing, will need to continue to create offensive flow by penetrating from the top, which will then cause rotations from both the inside and the helpside, resulting in dump offs to Meeks, Johnson and Hicks down low, or kick outs for open looks by Paige, Jackson and Pinson. 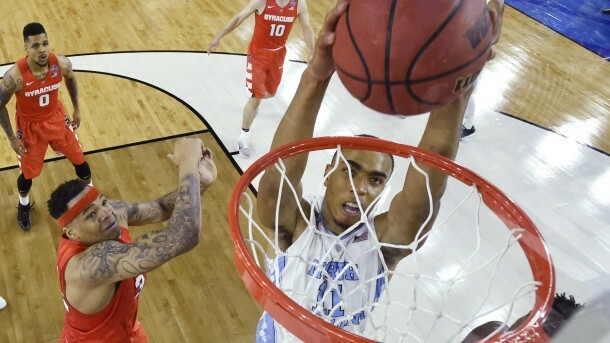 Also, and more importantly, the Heels will have to continue to dominate the offensive glass. Nothing makes up for a missed - or bad - shot better than an offensive rebound, and nobody is better on the offensive glass than the Heels. Defensively, the Heels will need to step it up big time. While they have played lock down D at times, it tends to be more in spurts than on a consistent basis. North Carolina will need - at least - 40 minutes of hard nosed, slap the floor, defensive intensity Monday night if they hope to knock off Villanova. Why? Because the Cats are a disciplined, veteran team that can kill you in a variety of ways, but mostly from beyond the three point line, where they have been scoring nets for the last 3 weeks now. Villanova does not settle. They will continue to move the ball and dribble penetrate until they get the best possible look at the basket. And when they get that look, they will knock it down. UNC cannot resort back to standing up on the perimeter, and not rotating over when Brunson, Arcidiacono and Hart drive middle, because the Wildcats will make them pay. Know that. Although both teams are averaging in the mid to upper 80's, expect a much more low scoring game. Remember, Villanova will be - by far - the best defensive unit the Heels have faced all tournament, and the Heels will be the biggest team Villanova has seen, maybe all season. Both of those factors will translate into less scoring. Not a 39-36 snoozer, but something closer to a game in the high-60's/low-70's. Regardless of defensive intensity and interior length, both teams will get points on the board. This game should ultimately come down to which team's strengths prevail. For Villanova, that will be perimeter defensive pressure and three point shooting. For Carolina, that will be offensive rebounding and transitional scoring. Vegas has North Carolina as an early 2 point favorite, which feels about right. For the Heels to bring a sixth national championship back to Chapel Hill, they will have to play their best game of the season and execute on all levels, something that they are more than capable of doing as they are currently playing their best basketball. Get ready for a classic Tar Heel Nation.